Government debt (also known as public interest, public debt, national debt and sovereign debt)   contrasts to the annual government budget deficit, which is a flow variable that equals the difference between government receipts and spending in a single year. The debt is a stock variable, measured at a specific point in time, and it is the accumulation of all prior deficits. Government debt can be categorized as internal debt (owed to lenders within the country) and external debt (owed to foreign lenders). Another common division of government debt is by duration until repayment is due. Short term debt is generally considered to be for one year or less, and long term debt is for more than ten years. Medium term debt falls between these two boundaries. A broader definition of government debt may consider all government liabilities, including future pension payments and payments for goods and services which the government has contracted but not yet paid. Governments create debt by issuing government bonds and bills. Less creditworthy countries sometimes borrow directly from a supranational organization (e.g. the World Bank) or international financial institutions. Monetarily sovereign countries (such as the United States of America, the United Kingdom, Australia and most other countries, in contrast with eurozone countries) that issue debt denominated in their home currency can make payments on the interest or principal of government debt by creating money, although at the risk of higher inflation. In this way their debt is different from that of households, which are restricted by their income. Thus such government bonds are at least as safe as any other bonds denominated in the same currency. During the Early Modern era, European monarchs would often default on their loans or arbitrarily refuse to pay them back. This generally made financiers wary of lending to the king and the finances of countries that were often at war remained extremely volatile. The creation of the first central bank in England—an institution designed to lend to the government—was initially an expedient by William III of England for the financing of his war against France. He engaged a syndicate of city traders and merchants to offer for sale an issue of government debt. This syndicate soon evolved into the Bank of England, eventually financing the wars of the Duke of Marlborough and later Imperial conquests. A new way to pay the National Debt, James Gillray, 1786. King George III, with William Pitt handing him another moneybag. The founding of the Bank of England revolutionised public finance and put an end to defaults such as the Great Stop of the Exchequer of 1672, when Charles II had suspended payments on his bills. From then on, the British Government would never fail to repay its creditors. In the following centuries, other countries in Europe and later around the world adopted similar financial institutions to manage their government debt. Public debt as a percent of GDP, evolution for USA, Japan and the main EU economies. A government bond is a bond issued by a national government. Such bonds are most often denominated in the country's domestic currency. Sovereigns can also issue debt in foreign currencies: almost 70% of all debt in 2000 was denominated in US dollars. Government bonds are sometimes regarded as risk-free bonds, because national governments can if necessary create money de novo to redeem the bond in their own currency at maturity. Although many governments are prohibited by law from creating money directly (that function having been delegated to their central banks), central banks may provide finance by buying government bonds, sometimes referred to as monetizing the debt. General government debt as percent of GDP, United States, Japan, Germany. Interest burden of public debt with respect to GDP. Public debt is the total of all borrowing of a government, minus repayments denominated in a country's home currency. CIA's World Factbook lists only the percentages of GDP; the total debt and per capita amounts have been calculated in the table below using the GDP (PPP) and population figures of the same report. A debt to GDP ratio is one of the most accepted ways of assessing the significance of a nation's debt. For example, one of the criteria of admission to the European Union's euro currency is that an applicant country's debt should not exceed 60% of that country's GDP. Municipal bonds, "munis" in the United States, are debt securities issued by local governments (municipalities). Governments often borrow money in a currency in which the demand for debt securities is strong. An advantage of issuing bonds in a currency such as the US dollar, the pound sterling, or the euro is that many investors wish to invest in such bonds. Countries such as the United States, Germany, Italy and France have only issued in their domestic currency (or in the Euro in the case of Euro members). Relatively few investors are willing to invest in currencies that do not have a long track record of stability. A disadvantage for a government issuing bonds in a foreign currency is that there is a risk that it will not be able to obtain the foreign currency to pay the interest or redeem the bonds. In 1997 and 1998, during the Asian financial crisis, this became a serious problem when many countries were unable to keep their exchange rate fixed due to speculative attacks. Although a national government may choose to default for political reasons, lending to a national government in the country's own sovereign currency is generally considered "risk free" and is done at a so-called " risk-free interest rate." This is because the debt and interest can be repaid by raising tax receipts (either by economic growth or raising tax revenue), a reduction in spending, or by creating more money. However, it is widely considered that this would increase inflation and thus reduce the value of the invested capital (at least for debt not linked to inflation). This has happened many times throughout history, and a typical example of this is provided by Weimar Germany of the 1920s, which suffered from hyperinflation when the government massively printed money, because of its inability to pay the national debt deriving from the costs of World War I. In practice, the market interest rate tends to be different for debts of different countries. An example is in borrowing by different European Union countries denominated in euros. Even though the currency is the same in each case, the yield required by the market is higher for some countries' debt than for others. This reflects the views of the market on the relative solvency of the various countries and the likelihood that the debt will be repaid. Further, there are historical examples where countries defaulted, i.e., refused to pay their debts, even when they had the ability of paying it with printed money. This is because printing money has other effects that the government may see as more problematic than defaulting. A politically unstable state is anything but risk-free as it may—being sovereign—cease its payments. Examples of this phenomenon include Spain in the 16th and 17th centuries, which nullified its government debt seven times during a century, and revolutionary Russia of 1917 which refused to accept the responsibility for Imperial Russia's foreign debt. Another political risk is caused by external threats. It is mostly uncommon for invaders to accept responsibility for the national debt of the annexed state or that of an organization it considered as rebels. For example, all borrowings by the Confederate States of America were left unpaid after the American Civil War. On the other hand, in the modern era, the transition from dictatorship and illegitimate governments to democracy does not automatically free the country of the debt contracted by the former government. Today's highly developed global credit markets would be less likely to lend to a country that negated its previous debt, or might require punishing levels of interest rates that would be unacceptable to the borrower. U.S. Treasury bonds denominated in U.S. dollars are often considered "risk free" in the U.S. This disregards the risk to foreign purchasers of depreciation in the dollar relative to the lender's currency. In addition, a risk-free status implicitly assumes the stability of the US government and its ability to continue repayments during any financial crisis. Lending to a national government in a currency other than its own does not give the same confidence in the ability to repay, but this may be offset by reducing the exchange rate risk to foreign lenders. On the other hand, national debt in foreign currency cannot be disposed of by starting a hyperinflation;[ citation needed] and this increases the credibility of the debtor. Usually small states with volatile economies have most of their national debt in foreign currency. For countries in the Eurozone, the euro is the local currency, although no single state can trigger inflation by creating more currency. Lending to a local or municipal government can be just as risky as a loan to a private company, unless the local or municipal government has sufficient power to tax. In this case, the local government could to a certain extent pay its debts by increasing the taxes, or reduce spending, just as a national one could. Further, local government loans are sometimes guaranteed by the national government, and this reduces the risk. In some jurisdictions, interest earned on local or municipal bonds is tax-exempt income, which can be an important consideration for the wealthy. Public debt clearing standards are set by the Bank for International Settlements, but defaults are governed by extremely complex laws which vary from jurisdiction to jurisdiction. Globally, the International Monetary Fund can take certain steps to intervene to prevent anticipated defaults. It is sometimes criticized for the measures it advises nations to take, which often involve cutting back on government spending as part of an economic austerity regime. In triple bottom line analysis, this can be seen as degrading capital on which the nation's economy ultimately depends. Those considerations do not apply to private debts, by contrast: credit risk (or the consumer credit rating) determines the interest rate, more or less, and entities go bankrupt if they fail to repay. Governments need a far more complex way of managing defaults because they cannot really go bankrupt (and suddenly stop providing services to citizens), albeit in some cases a government may disappear as it happened in Somalia or as it may happen in cases of occupied countries where the occupier doesn't recognize the occupied country's debts. Smaller jurisdictions, such as cities, are usually guaranteed by their regional or national levels of government. When New York City declined into what would have been a bankrupt status during the 1970s (had it been a private entity), by the mid-1970s a " bailout" was required from New York State and the United States. In general, such measures amount to merging the smaller entity's debt into that of the larger entity and thereby giving it access to the lower interest rates the larger entity enjoys. The larger entity may then assume some agreed-upon oversight in order to prevent recurrence of the problem. As this theory gained global popularity in the 1930s, many nations took on public debt to finance large infrastructural capital projects—such as highways or large hydroelectric dams. It was thought that this could start a virtuous cycle and a rising business confidence since there would be more workers with money to spend. Some[ who?] have argued that the greatly increased military spending of World War II really ended the Great Depression. Of course, military expenditures are based upon the same tax (or debt) and spend fundamentals as the rest of the national budget, so this argument does little to undermine Keynesian theory. Indeed, some[ who?] have suggested that significantly higher national spending necessitated by war essentially confirms the basic Keynesian analysis (see Military Keynesianism). Nonetheless, the Keynesian scheme remained dominant, thanks in part to Keynes' own pamphlet How to Pay for the War, published in the United Kingdom in 1940. Since the war was being paid for, and being won, Keynes and Harry Dexter White, Assistant Secretary of the United States Department of the Treasury, were, according to John Kenneth Galbraith, the dominating influences on the Bretton Woods agreements. These agreements set the policies for the Bank for International Settlements (BIS), International Monetary Fund (IMF), and World Bank, the so-called Bretton Woods Institutions, launched in the late 1940s for the last two (the BIS was founded in 1930). These are the dominant economic entities setting policies regarding public debt. Due to its role in setting policies for trade disputes, the World Trade Organization also has immense power to affect foreign exchange relations, as many nations are dependent on specific commodity markets for the balance of payments they require to repay debt. Assess the expected value of any public asset being constructed, at least in future tax terms if not in direct revenues. A choice must be made about its status as a public good—some public "assets" end up as public bads, such as nuclear power plants which are extremely expensive to decommission—these costs must also be worked into asset values. Determine whether any public debt is being used to finance consumption, which includes all social assistance and all military spending. Determine whether triple bottom line issues are likely to lead to failure or defaults of governments—say due to being overthrown. Determine whether any of the debt being undertaken may be held to be odious debt, which might permit it to be disavowed without any effect on a country's credit status. This includes any loans to purchase "assets" such as leaders' palaces, or the people's suppression or extermination. International law does not permit people to be held responsible for such debts—as they did not benefit in any way from the spending and had no control over it. Determine if any future entitlements are being created by expenditures—financing a public swimming pool for instance may create some right to recreation where it did not previously exist, by precedent and expectations. Sovereign debt problems have been a major public policy issue since World War II, including the treatment of debt related to that war, the developing country "debt crisis" in the 1980s, and the shocks of the 1998 Russian financial crisis and Argentina's default in 2001. Government "implicit" debt is the promise by a government of future payments from the state. Usually this refers to long-term promises of social payments such as pensions and health expenditure; not promises of other expenditure such as education or defense (which are largely paid on a " quid pro quo" basis to government employees and contractors). A problem with these implicit government insurance liabilities is that it is hard to cost them accurately, since the amounts of future payments depend on so many factors. First of all, the social security claims are not "open" bonds or debt papers with a stated time frame, " time to maturity", " nominal value", or " net present value". In the United States, as in most other countries, there is no money earmarked in the government's coffers for future social insurance payments. This insurance system is called PAYGO ( pay-as-you-go). Alternative social insurance strategies might have included a system that involved save and invest. ^ "Bureau of the Public Debt Homepage". United States Department of the Treasury. Archived from the original on October 13, 2010. Retrieved October 12, 2010. ^ "FAQs: National Debt". United States Department of the Treasury. Archived from the original on October 21, 2010. Retrieved October 12, 2010. ^ Tootell, Geoffrey. "The Bank of England's Monetary Policy" (PDF). Federal Reserve Bank of Boston. Retrieved 22 March 2017. ^ Committee of Finance and Industry 1931 (Macmillan Report) description of the founding of Bank of England. Books.google.ca. 1979. ISBN 9780405112126. Retrieved 10 May 2010. "Its foundation in 1694 arose out the difficulties of the Government of the day in securing subscriptions to State loans. Its primary purpose was to raise and lend money to the State and in consideration of this service it received under its Charter and various Act of Parliament, certain privileges of issuing bank notes. The corporation commenced, with an assured life of twelve years after which the Government had the right to annul its Charter on giving one year's notice. Subsequent extensions of this period coincided generally with the grant of additional loans to the State"
^ Ferguson, Niall (2008). The Ascent of Money: A Financial History of the World. Penguin Books, London. p. 76. ISBN 9780718194000. ^ "Empirical Research on Sovereign Debt and Default" (PDF). Federal Reserve Board of Chicago. Retrieved 2014-06-18. ^ "EU accused of 'head in sand' attitude to Greek debt crisis". Telegraph.co.uk. Retrieved 2012-09-11. ^ "Country Comparison :: Public debt". cia.gov. Retrieved May 16, 2013. ^ "Government – Historical Debt Outstanding – Annual". Treasurydirect.gov. 2010-10-01. Retrieved 2011-11-08. ^ "Debt to the Penny (Daily History Search Application)". Treasurydirect.gov. Retrieved 2014-02-03. ^ "Country Comparison :: Public debt". cia.gov. Archived from the original on October 15, 2008. Retrieved November 8, 2011. ^ Hedlund, Stefan (2004). "Foreign Debt". Encyclopedia of Russian History (reprinted in Encyclopedia.com). Retrieved 3 March 2010. ^ "The Economics and Law of Sovereign Debt and Default" (PDF). Journal of Economic Literature. 2009. Retrieved 2014-06-18. ^ "Government Social Benefits Table". Archived from the original on November 1, 2004. ^ "Council Regulation (EC) No 479/2009". Retrieved 2011-11-08. 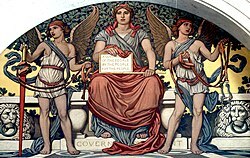 Wikimedia Commons has media related to Government debt. Wikisource has the text of a 1905 New International Encyclopedia article about Government debt. "Government's Borrowing Power". DebatedWisdom. 3IVIS GmbH. Retrieved 29 October 2016.